I haven’t had much luck with lettuce in past years. So much so that it wasn’t on my radar when I first looked at seeds last spring. But I figured I’d give it another try, mainly because I eat a lot of salads. I planted Black Seeded Simpson (loose-leaf) and Red Romaine (both Livingston). I was pleasantly surprised. Both lettuces were very easy to grow, and as long as I kept harvesting, they kept growing. The crunchy red Romaine lettuce was a treat mixed in with the green loose-leaf variety. Definitely want to plant these — or a similar variety — again this summer. Onions. Two years ago, it was so wet the onions rotted in the ground. Last summer, however, was a different story. They were the biggest and most pungent onions I’ve ever seen, let alone grown (Yellow Spanish onions from the local Stein’s). 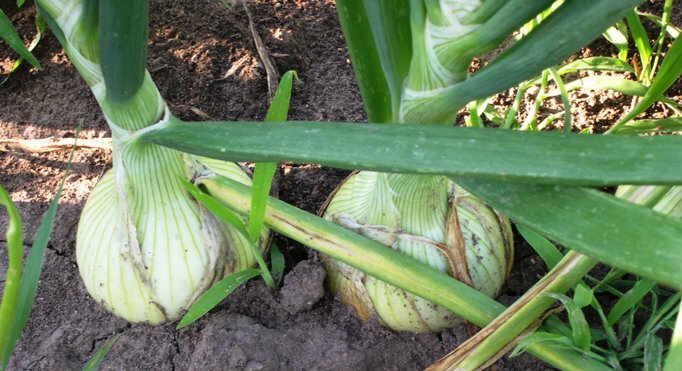 Onions in mid-July. Great smelling, beautiful to look at. The green tops had to be 2 feet tall. They could easily have won a blue ribbon at the county fair (or so I was told by one of my Facebook friends!). There were days when I would just plunk myself down in the dirt between the three short rows and just inhale their smell while I pulled weeds. They lasted well into the early winter, too – I don’t think I had to buy onions from the store until December. Potatoes. I planted four short rows of red seed potatoes (didn’t save the bag, but the receipt from Stein’s says “seed potatoes, red La So”), which yielded probably about two five-gallon pails full when all was said and done. Some were harvested early when they were a bit smaller just because we couldn’t wait to taste fresh potatoes. The last ones harvested were big and beautiful and lasted until about mid-November. Pumpkins. I haven’t tried to grow pumpkins before last summer, mainly because of space reasons. But when I decided to till under the strawberries, I realized I had the perfect space. I planted Jack-O’-Lanterns (Burpee’s) and what I referred to as “bumpy” pumpkins. Since then, I’ve also heard them referred to as warty pumpkins. Either adjective fits. The bumpy seeds I saved from several pumpkins I bought the year before at our local grocery store. I had never seen them before and thought they were so cute! Both varieties of pumpkins did well for me, although I forgot to save seed from either. They did make delicious roasted seeds though! I have tons of seed left from the original batch, but my guess is that the 2-year-old seeds might not produce as well. Other assorted things that worked: I planted a packet of dill seeds the first year I started my garden (2009) and haven’t had to plant it again. It seeds itself every fall and reappears the next summer. The smell of dill is another one of those garden smells that just drives me crazy – love it! And it doesn’t really take up any extra space. It comes up where it comes up. If that’s where I think it will crowd out something else, I remove it. The summer I started the garden I also planted a mixture of everbearing raspberry plants. Some were transplants from a co-worker who gave me extras from his patch. I also bought a few plants – in all, I think I had about 25 small plants (none taller than 10-12 inches) the first year. Three summers later, my raspberry patch is about 5 feet by 10 feet wide and produces an incredible amount of berries starting in mid-summer and all the way through the fall. And the nice thing is that I do very little to get them to grow. I did find a pretty good post by a couple of Virginia bloggers on pruning raspberries and I may have to take some of their advice this year. And the winners are: Everything but pumpkins will be on this year’s garden list. Although the pumpkins did well, I’m thinking I might need the extra space in order to do more plantings of peas, beans and lettuce. And I can ALWAYS use one more tomato plant!